We want the funk. Give up the funk. On Wednesday August 1, 2018, legendary Rock and Roll Hall of Famer George Clinton will bring the funk to Ardmore Music Hall. 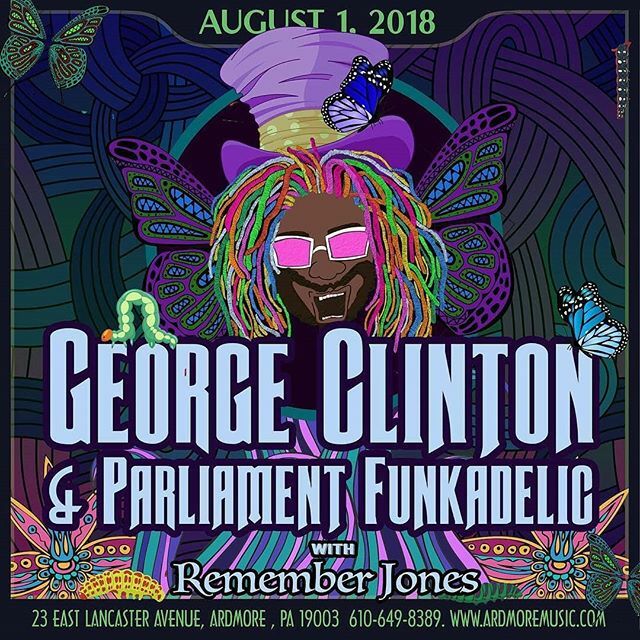 On his final tour, Clinton and Parliament Funkadelic are sure to highlight their rock-solid career featuring out-of-this-world works like “Flashlight,” “Atomic Dog,” “Bop Gun” and “Tear the Roof off the Sucker.” Remember Jones will get the rock-funk party started. Tags: 2018, Ardmore, Ardmore Music Hall, Atomic Dog, August 1, Bop Gun, Flash Light, Funkadelic, George Clinton, Give Up the Funk, PA, Parliament, Parliament-Funkadelic, Remember Jones, Rock and Roll Hall of Fame, Tear the Roof off the Sucker. Bookmark the permalink.